Q.Do you know what our brain is doing when we are asleep? our brain may be replaying the scenes that happened the day before when we are asleep. 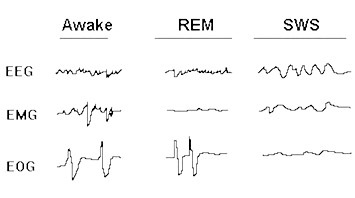 The EEG (Electroencephalogram) shows the activity of the brain; the EMG (Electromyogram) shows our muscle activity; while the EOG (Electroencephalogram) shows the movement of our nerve. The activity chart would be different when we are awake, in Rapid Eye Movement (Paradoxical Sleep) or during Slow-wave Sleep (Deep Sleep).